Traditional with a modern twist. 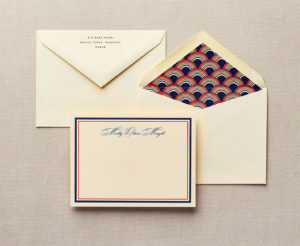 A pop of foil stamping adjoins the bride and groom’s names, while a foil XOXO peeks out from the corner of the outer envelope. For 100 sets, pricing starts at $18 per set for Flat Printing, $20.50 per set for Flat Premium and $24 per set for Letterpress Printing.